The shock reflection over a double wedge in dusty gas is numerically investigated in the present paper by the VAS2D (two-dimensional and axisymmetric vectorized adaptive solver) program which solves the compressible two-phase Euler equations with second-order accuracy in space and time. The non-equilibrium effects on the reflection wave configuration are emphasized. 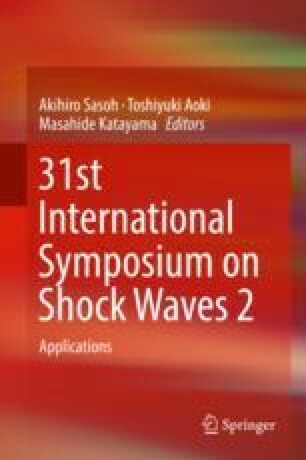 The reflection process for a shock wave propagating in dusty gas greatly differs from the pure gas case, and the wave configuration is found to depend on the distance traveled by the incident shock. The reflection wave structures with a short scale are different from that with a large scale. The non-equilibrium effects related to the particle relaxation change the transition criterion and complicate the shock reflection process.